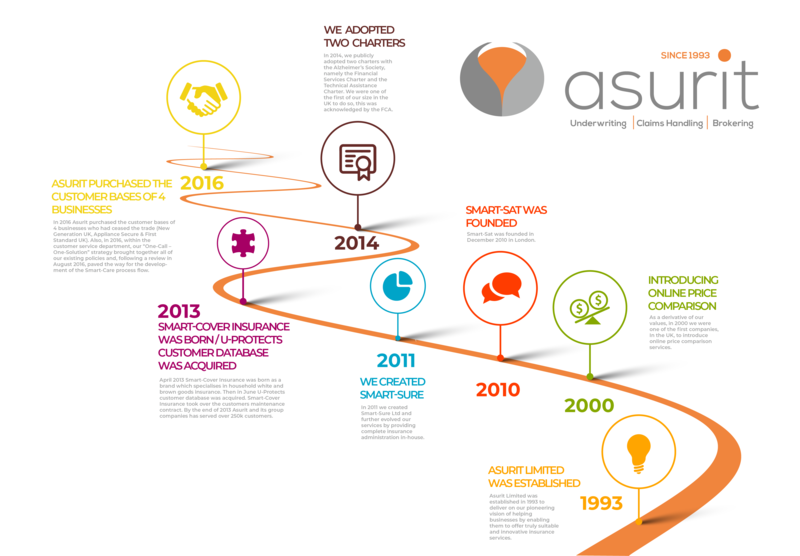 Asurit Limited was established in 1993 and since then we have continued to offer appropriate and innovative insurance services to our customers. With over twenty five years market experience, we recognise that nothing is more important than peace of mind. Our aim is to give customers the best cover for their circumstances combined with the provision of ongoing support. As an example of our innovation is that we were one of the first companies in the UK to introduce online insurance comparison services thereby providing our customers with choice and flexibility. It is our ability to understand what people actually want and need that has made us the success story we are today; a reliable and trusted insurance intermediary. To observe and comply with all statutory and regulatory requirements whilst implementing best practice. We will treat all our customers fairly. We will always listen to and engage with our customers to identify their needs. We are committed to deliver a fair and transparent operation at all times. We develop and enforce our compliance procedures on a Best Practice basis so we can consistently exceed the minimum regulatory requirements. By following the above policies, Asurit obtained FCA Authorisation on January 14th 2005, thereby demonstrating that our compliance and regulatory standards are in line with those set by the regulators. All of our products are designed and tailored to provide a specific sector, or consumer group, with unique and effective cover. Our commitment to deep rooted fairness allows us to constantly evolve and develop an innovative portfolio, as evidenced by our past achievements. The domestic products offered provide flexible alternatives to any mainstream home and content policy giving a wide range of life-style protection via award-nominated consumer care. They also provide comprehensive protection with the added benefits of competitive premium rates, limited or no excess and streamlined, rapid claims settlements. This latter element is the result of our leading IT infrastructure and live management information. All of these benefits yielding a lasting client loyalty and an excellent reputation!